There is nothing that can beat the feeling of a perfect hit with the driver! This game is all about the two best features of golf: Hitting furiously long drives & kicking your friends butts! 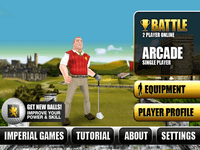 That is why we have produced this network based, action golf game with the driver as your only weapon. This game has three major difficulties. 1. Unlike most golf games there are no bars to show when to start and when to finish your swing. It is more difficult our way, but in the same time a lot more fun. You have to learn the behaviour of your character and learn when to press in order to get a perfect hit. 2. When you have hit the ball you have to use the phone´s gyroscope in order to steer the ball. No matter if you hit a “monster shot” or not, the wind will be a big challenge for you. Of course the wind varies from course to course and gets more and more difficult to handle. 3. When you feel somewhat confident that you master 1 & 2 above you are ready to enter the battle mode. In battle mode you will definitely experience difficulty number three; the stress. The game takes place at four different arenas with different access levels depending on your own ranking. Everybody starts out as Duffers with a limited acces to only New Down Under. As you progress and level up you will gain access to our other arenas. Thanks to the fact that the game is network based you will be able to play against your friends independent of what platform they are on.